Why are stem cells so powerful as a therapy? go anywhere in the body where they are needed to stimulate new growth. For example, a stem cell can become cartilage, should it be needed. They are immature cells that are capable of giving rise to several different cell types. 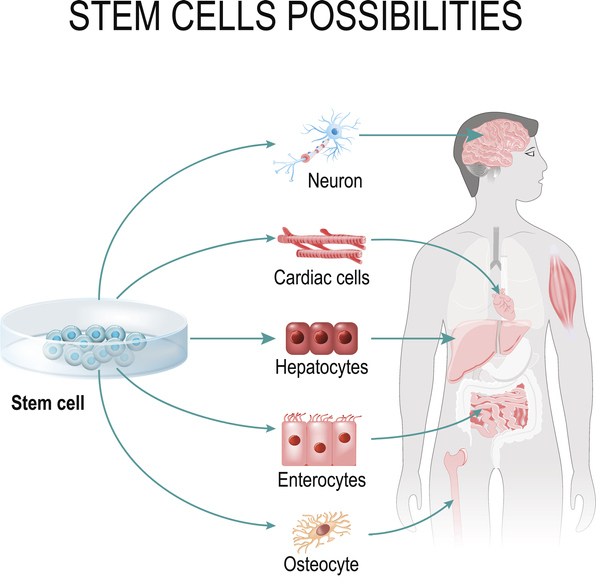 Stem cells possibilities. These cells can become any tissue in the body. Internal organs in the background of a male figure and a human cell (gepatocytes, osteocyte, cardiac, enterocytes, neuron). HAM or (Human Amniotic Membrane) is a stem cell source for joint repair that is affordable, powerful and non-intrusive. To learn more about this HAM stem cell therapy at Reno Integrative Medical Center click here. Reno Integrative Medical Center is located in Reno Nevada. Specializing in Integrative Cancer treatment, chronic disease and health restoration. Dr. Robert Eslinger is available to discuss treatment options either by an office visit or phone consult. If you have quick questions you would like to ask, fill out our form at contact us and our liaison service will respond. PRP, (platelet rich plasma), injections for joint regeneration are becoming more widely known as a way to restore joint function without having to undergo surgery. Umbilical cord stem cell injections, is another way that has become available for people to do the same thing. What are the differences (and the similarities)? Just what is PRP? It is a concentration of the platelets from a person’s own blood. A blood sample is drawn and the tubes are spun in a centrifuge to separate the platelets from the other blood cells. It is known that these platelets are one part of the clotting cycle that helps clot our blood in the event of any situation where our blood needs to clot to keep us from bleeding to death. What was discovered about 20 years ago is that these same platelets are also jam packed full of what is called “growth factors” that are released at a site of trauma to help us heal faster. This was first put to use by dentists who started injecting concentrated platelets into a tooth socket that had just had the tooth extracted. This helped prevent a very painful condition called “dry socket”. Subsequently, some Orthopedic Surgeons started trying to help people with degenerative joint diseases by injecting it right into the broken down joint. They started finding that many times it would help regenerate the joint. The added advantage is that this is accomplished using the persons own cells so there is no chance of rejection or an allergic reaction to it. Sometimes it takes a few injections, a few weeks apart, to get the full therapeutic effect. Many times the benefits last for years. One study (done by Orthopedists) even showed that it was able (in some cases) to regenerate the cartilage in the knee! Stem Cell injections on the other hand, are not the person’s own cells. They are harvested from the umbilical cord and placenta of newborn healthy babies with the full knowledge and consent of the mother. They offer the possibility of the same benefits, usually with a less number of injections. They also do not trigger any reactions because they are such young cells they do not stimulate a response from the immune system. The big difference between the two injections is the cost. The cost for stem cells is higher. The stem cells would be better for a person with more severe disease because they are more potent in stimulating a healing reaction. Both of these techniques offer hope for people with degenerative joint disease who are unwilling or unable to undergo artificial joint replacement surgery. Reno Integrative Medical Center offers both of these therapies. Watch informative videos on his you tube channel.